John Gleason captured this amazing shot of the comet Hale-Bopp in March 1997. It turns out our sun may be a cosmic thief that's stolenmost of its comets from other stars, a new study suggests. Comets are small icy bodies that flare up when they near thesun as solar radiation vaporizes their ice to create a glowing tail. New computer simulations of the billionsof comets crisscrossing the solar system suggest that most of themoriginated beyond our local neighborhood, but got grabbed and pulled in by oursun's gravity later. Such a scenario goes against the long-standing model forcomet evolution, which holds that most of our local comets come from the sameregion where the sun and its planets formed. This region, known as the Oortcloud, encircles the solar system and extends far beyond Pluto. 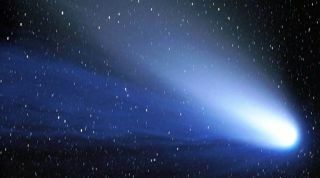 According to researcher Hal Levison, an astronomer at theSouthwest Research Institute in Boulder, Colo., however, "the standardmodel can't produce anywhere near the number of comets we see." "This model says the comets are dregs of our own solarsystem's planetary formation and that our planets gravitationally booted themto huge distances, populating the cloud," Levison explained. Such aprocess would likely have occurred around other stars as well, with each givingrise to their own cloud of comet debris. But stars may not have held on to their initial clouds. Like many other stars, the sun was birthed in an open star clusterthat disintegrated over time. These clusters, typically containing between tenand a thousand stars jammed into a tiny space, have an average radius not muchdifferent from the present day Oort cloud. The close proximity of stars withinthese clusters could have allowed stars to "steal" fledgling cometsfrom one another. And a star wouldn't have had to have been the biggest inorder to be the most successful thief. If a comet moved far enough away fromits parent star and close enough to the sun, for example, the sun's gravitycould trap it even if the parent star was significantly more massive. The distance of the Oort cloud from Earth makes it difficultto observe ? much less pin down the exact number of comets it contains. Theamount of comets that exist there must be inferred from observations of thosecomets that light up as they pass near the sun. But based on this data, Levison and his team say there seemto be around 400 billion comets hovering just beyond Pluto. In comparison, theconventional model predicts only 6 billion. "That's?a huge discrepancy," Levison said. "Toohuge to be explained by mistakes in the estimates. There's no way we could bethat far off, so there has to be something wrong with the model itself." The orbits of many long-periodcomets seem to support that finding. Their highly oblong orbits take them farout into the depths of space. "So they couldn't have been born in orbit around thesun," Levison said. "They had to have formed close to other stars andthen been hijacked here." Comets are generally regarded as excellent snapshots of theearly solar system, because they spend much of their lives encased in ice. Butif some of these comets come from outside our solar system, then they can tellus about their parent stars, as well. "We can study the orbits of comets and put theirchemistry into the context of where and around which star they formed,"Levison said. "It's intriguing to think we got some of our 'stuff' fromdistant stars. We're kin."